Orphanology unveils the grassroots movement that's engaged in a comprehensive response to serve hundreds of millions of orphans and "functionally parentless" children. Orphanology unveils the grassroots movement thats engaged in a comprehensive response to serve hundreds of millions of orphans and functionally parentless children. Youll see a breadth of ways to care with biblical perspective and reasons why we must. Heartwarming, personal stories and vivid illustrations from a growing network of families, churches, and organizations that cross culture show how to respond to Gods mandate. The book empowers: - churchesto plan preaching, teaching, ministering, missions, funding adoption, supporting orphans; - individuals and familiesto overcome challenges and uncertainties; - every believerto gain insights to help orphans in numerous ways. Discover how to - adopt; - assist orphans in transition; - engage in foster care; - partner with faith-based fostering agencies; - become orphan hosts. Along with their families adoption stories, Merida and Morton give steps for action and features on churches doing orphan ministry, faith-based childrens homes, orphan-hosting groups, and other resources. Tony Merida is the founding pastor of Imago Dei Church in Raleigh, North Carolina. He also serves as associate professor of preaching at Southeastern Baptist Seminary in Wake Forest, North Carolina.Tony has published several books, including Orphanology, Faithful Preaching, Ordinary: How to Turn the World Upside Down, and Proclaiming Jesus. 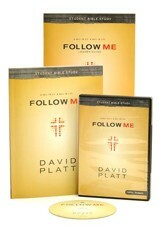 Tony also authored eight volumes in the Christ-Centered Exposition commentary series, of which he also served as a general editor, along with Danny Akin and David Platt. Tony and his wife, Kimberly, are the proud parents of five adopted children. Tony Merida and Rick Morton are living examples of James 1:27-they have a combined eight adopted children between their families. Rick, along with his wife, Denise, played an integral role in the cofounding of Promise 139, an international orphan-hosting ministry. He serves as discipleship pastor at Temple Baptist Church in Hattiesburg, Mississippi, and has numerous youth ministry publications to his credit. Pastor, professor, and father of five, Tony Merida has quickly become a leading voice in the growing movement for adoption and orphan care. 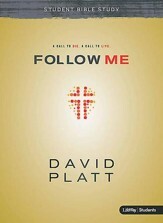 His passion for the fatherless is evident through his writing, teaching, and speaking. Visit Tony online at www.tonymerida.net. 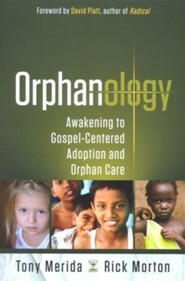 In Orphanology, authors Tony Merida and Rick Morton make the assertion that orphan care is a requirement of all Christians. With an estimated 147 million orphans worldwide, the authors contend that because God set the example by adopting us as his own, we are likewise to care for these children. Both authors are involved in formal ministry and also have experience with adoption: each have welcomed multiple adopted children into their homes. Whereas the authors concede that adoption, specifically, may not be everyone's calling, care of orphans is. 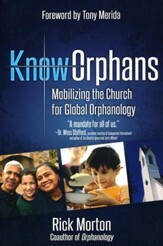 As Rick Morton writes, "Orphanology focuses on orphans and adoption, but at the center of this book, like all of life, is God's eternal story, the gospel" (p. 7). The book contains an easy-to-read mix of personal adoption recollections from themselves and their extended families and their friends, detailed biblical theses on the subjects of adoption, and how the organized church and its people should, and can, respond to the issue of orphan care. 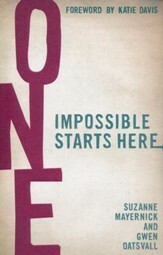 The first part of this book focuses on the need for orphan care and God's call to action. Beyond this solid theological argument for orphan care, the second part of the book provides a number of practical guidelines and ideas for how God's people can participate in this important work. Chapter titles include: "How Do You Lead a Church to Care for the Fatherless? "; "How Do You Do Missions Through Orphanage Funding, Personnel, and Training? "; and "How Can the Church Respond in Foster Care?" The theme of both the book and the authors' formal ministries is James 1:27: "Religion that is pure and undefiled before God, the Father, is this: to visit orphans and widows in their affliction, and to keep oneself unstained from the world." I'm the author/artist and I want to review Orphanology: Awakening to Gospel-Centered Adoption and Orphan Care.